Yesterday I just wanted to find out about solar appliances for home. Actually I'm thinking to buy air conditioners for home.So I searched first for a solar air conditioner. In the search I found only one prominent air conditioner from a company called Solcool.Some blogs have mentioned its price to be around 4499$ and labour costs of 750-1500$ . The all DC, Millennia air conditioning & heating system is revolutionary in many ways. The patented, low power Millennia is globally distributed through SolCool One, LLC, (info@solcool.net) along with its wind turbine, lighting and drinking water filtration products. The 2-Ton Millennia HVAC system uses up to 75% less energy than comparable high efficiency conventional equipment as per the website. This solcool air conditioning system battery can also support 6 100 watt bulbs and 3 ceiling fans along with airconditioning.With a 6 to 18 hour battery bank capability,The Millennia requires very little renewable energy to run completely independent all day and night. This makes the Millennia one of a kind for zero emission climate control. 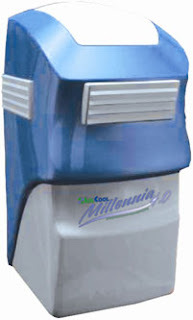 The Millennia is completely scaleable, units can be combined or zoned for 2-10 ton applications.Each Millennia has its own variable speed, DC blower that overcomes 1.5 inches of static pressure.The Millennia easily installs in the attic, outside, in a utility closet, garage or warehouse. A wheeled, portable version that is fully charged can be easily operated remotely for up to 18 hours. DC options that should be integrated into the 4.0 are; ceiling fans, lights and DC power ports. Check out this page for more information.May be as time progresses I hope these solar products prices will get reduced . But in countries like India , people should start using the solar power to the fullest to save their resources which are used in producing current.I think the life time of solar panels normally ranges from 3-25 years with performance degradation as time progresses.So all we need is to change solar panels after some years once we invest this system.I dont know whether its available in India at this moment.But its available in US at this moment as per the website. Readers Is there any possibility by which we can buy solar panels and connect them to the equipment at home ?? How many solar panels will be needed to support a 1 - ton airconditioner ? ?If you have any idea post it as comment . We in India have abundant solar resources.So your idea may help us.Post your valuable thoughts as comments. If you are new here , Subscribe to the blog here.